New beers and breweries come into our little state all the time. This past week alone, I’ve learned of about a handful of beers that have recently, or will soon, be available on Delaware shelves and taps. However, few have had me as excited lately as the news I got the other day that Starr Hill will soon be arriving. Master Brewer Mark Thompson opened up Starr Hill in 1999 having just returned from the craft beer mecca of Portland Oregon. Settling in Charlottesville in his home state of Virgina, Mark got busy brewing craft beers in a location shared with the Starr Hill Music Hall. Musicians tend to be travelers by nature, so if you want to spread word around about your product I suppose there’s no better customer base to appeal to. Soon word was getting around, and Mark found that not only were people starting to take interest in his beers, but so was the industry. Between the years of 1999 and 2011, Mark has racked up an impressive 17 medals at the Great American Beer Fest (GABF), as well as medals at the World Beer Cub in 2002 and 2005. Learning that Starr Hill was coming into the state, I decided to drive across the state line into Maryland where Mark’s beers are already available and get a preview of what was to come. And I can say with all honesty, I was not disappointed. 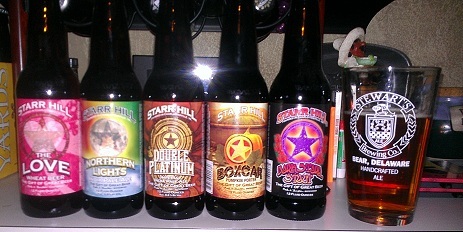 Here’s a run down of the beers from Starr Hill that I was able to taste. THE LOVE – Why not start with a little love? Love is the brewery’s GABF silver medal winning wheat beer. If you look down the beer’s information you can see that it’s pretty classically constructed; malt, wheat, with some munich thrown in. It gets its bitterness from an addition of Hallertau and is fermented to 4.6% with a Bavarian wheat yeast. The beer pours golden with a nice creamy white head. Both the nose and the taste have a nice combination of banana and clove. The Love is a very good example of a wheat beer. It hits all the check boxes and is well balanced and very drinkable. Half way through the glass I was starting to get a touch of lemon on the back end which just may have been my brain telling me that a lemon slice would be a nice addition to this beer. We’re off to a good start. NORTHERN LIGHTS – I then moved on to Starr Hill’s IPA which poured an amber/orange in the glass. My first sip was intense with huge citrus/floral notes balanced by a nice touch of caramel flavored malt. There was obviously a healthy addition of cascade hops in the mix (Starr Hill also adds williamette) which left my mouth with that nice prickly hop bite you get from a beer that has a high hop flavor. The back end has a lingering non-crisp bitterness and at the end of the glass you’re left with a slight resiny stickiness. At 6.5% ABV it’s definitely not a session beer, but I know some hop loving friends of mine who are going to drink a lot of this when it shows up on tap here in Delaware. Double Platinum – From the pour Double Platinum looks a lot like Northern Lights, maybe a touch darker. But once you get your nose into it, it’s obviously a complete different animal. The floral hop tones in Northern Lights are totally gone, replace by a strong, pungent mix of citrus and grapefruit. This is just pure hops from front to back. Man this beer is big and at 8.6% ABV, slightly dangerous. The ending has an intense hop burn that lingers for quite awhile which Starr Hill pulls off with copious amounts of centennial and simcoe hops. They claim that it has a strong malt backbone, but to be honest I didn’t get that, but it must be there to balance all these hops. Between the two ales I lean towards the Northern Lights, but Imperal/Double IPA fans are going to enjoy this. Boxcar – I’ve always thought that pumpkin would mix well with some of the dark beers styles out there. Unfortunately, the couple that I’ve had seem to always miss the mark in one aspect of another. Not true with Starr Hill’s Boxcar. The beer starts with a solid porter base built from two row, caramel and chocolate malts; and balanced out with traditional kent goldings hops. The brewery claims that they add pumpkin and spices, but to be honest, I get more of the pumpkin then the spices which is where I think this beer succeeds. The beer pours dark (no surprise) and has a nice noses of dark malts, chocolate and pumpkin. The flavor is more of the same, with just a touch of roasted grain flavor in the back. I get the pumpkin from beginning to end, and if even lingers a bit in the after taste, which besides that is very clean. I’ll be honest, pumpkin beers aren’t my normal go to, but I’m glad to finally have found one that pulls of the pumpkin/dark beer mix pretty competently. Dark Starr – I’m not sure if the folks at Starr Hill are going to like what I’m about to say (but it is said as a compliment) but this stout to me is very much like Guinness. It has a smooth, very drinkable flavor and bitterness reminiscent of coffee and dark chocolate, and to me is very reminiscent of the style defining stout from Saint Jame’s Gate. The finish is crisp and clean, and that along with the 4.2% ABV make this a beer that you can easily drink quite a few of. A run down of this beer shows that it is a very well constructed stout, with it’s base being Two Row, Roasted Barley, Chocolate, Munich, Wheat and some caramel to round it out. Perle hops are used to get it to 35 IBUs, which for me is pretty much the magic number for stout bitterness. I really loved this stout, and I must not be alone as it’s won three gold medals and two bronze medals at the GABF as well as a silver medal in the 2008 world beer cup. It’s not often that I taste a complete line from a brewery and find it solid from top to bottom, but that’s what we seem to have with Starr Hill. Every beer I tried from them is a excellent example of the style and I can’t wait for this brewery to start showing up on tap lists around the area. Word is that Starr Hill will be coming into the state sometime towards the beginning of 2013. I contacted brewery representative Allie Hochman and she indicated that at this moment they were not sure exactly when they are going to start to make their way into Delaware. She also indicated that she wasn’t sure what beers they would be bringing into the state when I asked her if there was any chance Starr Hill’s limited All Access beer series would be coming into Delaware (they have a Wee Heavy that I’d LOVE to try). So I guess I will just have to be patient, and see what comes. Star Hill has been available around here for a while. I don’t really seek them out, but I have certainly used them as the go to beer when I’m at a bar with few good offerings. I haven’t really had some thing from them I didn’t like. Solid brewery. Pingback: Beer – #83 – Hallertau – Barley Wine | Pdubyah – a life just as ordinary.